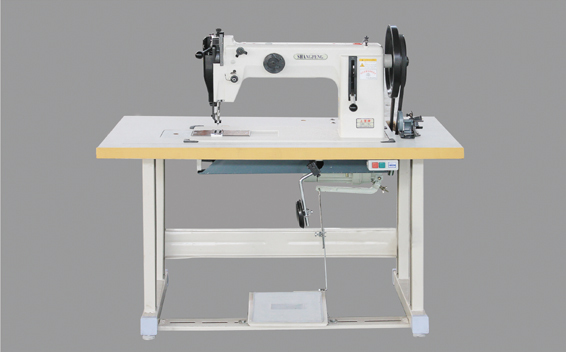 Characteristics:It is suitable for sewing thick material, especially for thick threads of No. 0 to No. 00.It adopts connecting rod tower crane, so it has smooth and even stitches. The feeding mechanism assorted with presser could lift synchronous, so it could sew super-thick material.The lifting height of knee control presser is 32mm, it is easy for super-thick material to pass.It adopts semi-rotative big oscillating shuttle, which could reduce the changing times of bobbin thread and improve the working efficiency.The working space is 420mm, which is convenient for thick and large sewing material pass and rotation.The maximum needle gauge 12mm Equipped with handle back sewing unit, which could be regulated simply.